Dolce & Gabbana products have been pulled from Chinese e-commerce sites as the backlash against a controversial ad campaign grows. The firm posted videos this week showing a Chinese model struggling to eat pasta and pizza with chopsticks. The campaign was accused of trivialising Chinese culture and promoting unflattering stereotypes. Local celebrities have called for a boycott of the brand. The brand crisis deepened when messages allegedly written by co-founder Stefano Gabbana, which included offensive comments about Chinese people, went viral. The firm apologised for any offence but said it and Gabbana’s Instagram accounts had been hacked. “We have nothing but respect for China and the people of China,” a message from the firm said. The Italian firm cancelled its fashion show in Shanghai earlier this week. 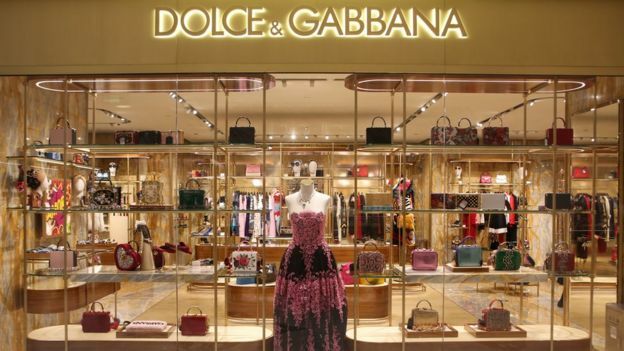 On Friday, Dolce & Gabbana products were not available in China on major e-commerce sites Taobao and JD.com, as well as smaller platforms Kaola and Secoo. Alina Ma, associate director of research at market insights firm Mintel, said the ad left Chinese consumers confused and appeared to show the company did not understand them. “They want a brand that knows them, that makes them feel that they are important,” Ms Ma said. It is a crucial market for luxury firms. A 2018 report by consultancy Bain & Company forecast the luxury goods market in mainland China will grow by up to 22% this year. “Chinese consumers continue to stand out as a growth-driver for the industry,” the report said. While the controversy could hurt their business, the long-term impact will depend on how Dolce & Gabbana deal with the fallout. “If they can show they sincerely want to know the Chinese consumer, want to know the Chinese market… their business may turn around,” Ms Ma said. It’s not the first time Dolce & Gabbana has drawn controversy. Last April the brand posted a campaign on Weibo that showed impoverished people in run-down areas of Beijing pictured with Dolce & Gabbana models ahead of a catwalk show in the city. The pictures were criticised for stereotyping Chinese history by showing old parts of the city, rather than more modern depictions of Beijing. Dolce & Gabbana also caused controversy in 2016 when it called an item of footwear in its spring/summer collection a “slave sandal”.